I recently got to do something I’ve been wanting to do for a long time: enroll in a high-deductible health insurance plan that qualifies me for a health savings account (HSA). I know, I know. It’s not exactly a dream vacation or even a new iPhone. But what can I say? I’m a huge money nerd and this kind of thing gets me excited. That’s right, they are the ONLY savings account that allows you to save and then spend your money COMPLETELY TAX-FREE. This makes them a fantastic way to save money on medical expenses. But it also makes them quite possibly the best retirement account out there. Every other retirement account either taxes your money on the way in (Roth IRA) or on the way out (401(k) and Traditional IRA). A health savings account lets you skip taxes all the way through. So yeah, I was pretty excited about the chance to finally open one and start contributing! Of course, this new opportunity brought up a big question: what’s the best place to open a health savings account? I’ve done this research for a few clients before, but this was the first time I was forced to do it for myself. And to be honest, every time I’ve looked into this I’ve found the search to be a little confusing. There are a lot of options and a lot of different variables to consider, and it can quickly feel overwhelming. I do want to be clear up front that I’m actually not an expert on this specific topic and that it’s entirely possible that there are better providers than the ones I chose, especially if you have different needs or preferences than I do. But my hope is that by showing you my process, it will be easier for you to find the right health savings account for your own needs when the time comes. Quick note: This is an updated version of a post I originally wrote in 2015. It’s been updated primarily to reflect the fact that I would choose different health savings accounts today than I did at that time, based on changes in fees, interest rates, investment options, and a number of other variables. Those updated choices, and the reasons for them, are detailed below in an effort to help you make the best choice possible given the current options available. How you plan on using the money in your health savings account has a big impact on how you should invest it, and therefore who the best provider might be. If you plan on using the money for current medical bills, keeping it in some kind of safe, easily accessible savings account probably makes the most sense. If you plan on investing it for the long-term, you’re probably going to prefer a provider with solid investment options. Personally, my family typically has fairly significant medical expenses each year. So while I would love to use our health savings account as an investment account, the truth is that for 2018 we’ll be contributing money with the expectation of spending it pretty quickly. For us, the tax breaks will essentially serve as a way to get discounted healthcare. But in order to make this post a little more helpful, I’m going to pretend that our needs are different. I’m going to pretend that our medical needs are fairly minimal. Aside from the occasional ear infection and other little trips to the doctor, mostly for our kids, we don’t typically have much in the way of medical expenses. Still, we like the idea of having some dedicated money set aside in case we run into a larger than expected medical bill. And having it in a tax-advantaged place like a health savings account is appealing. Keep $2,000 of our HSA in a safe investment. Something like a savings account where we can earn some interest and know that the money will be there when we need it. All HSA contributions on top of that $2,000 will be invested in line with my preferred investment philosophy. Having two different goals introduced a little complexity to my search for the best health savings account. After all, the best provider for a safe, interest-earning account might not be the same as the best provider for long-term investing. Still, in either case the first step was to collect information and figure out what my options were. Here are the main variables I considered. Fees – Fees are always a big deal with any kind of investment account or savings account, and HSAs are no different. I looked at setup fees, annual fees, monthly fees, trading fees, overdraft fees, debit card replacement fees, and anything else they may be able to charge me. The lower the fees the better. Interest rate – This was a bigger factor for the $2,000 I wanted to set aside specifically for medical expenses. While the difference between 0.1% and 1.5% on $2,000 certainly isn’t life-changing (about $28 per year), all else being equal I would rather earn more than less. It’s worth noting though that in most cases it was better to avoid fees than to get a better interest rate. Eligibility – A lot of the health savings accounts with competitive interest rates are run by local credit unions that have eligibility requirements, such as living in a particular state. Sometimes these requirements could be waived with a small contribution to a local charity and sometimes not. In my case, I was not eligible for many of the HSAs offering the highest interest rates. Ease of use – Could I utilize online banking? Was the website easy to navigate? Would they provide a debit card for easy payment at the point of care? Could I apply online or would I need to print out and mail in a bunch of paper forms? Investment options – For the long-term investment portion of my money, I wanted to see high quality, low-cost investment options that aligned with my personal investment philosophy. Minimum balance – Was there a minimum balance required to open the account? Did I need to maintain a minimum balance to either earn a certain interest rate or avoid certain fees? Want more help getting your family on the right financial track? Check out my free guide: The New Family Financial Road Map. I ended up using three main tools to find and compare health savings account providers. I updated the Amount field to $2,000, since this was the amount I planned to contribute. I left the State field as All because I’m comfortable doing all my banking online, even if there isn’t a branch near me. Starting at the top of the search results, I clicked the + sign for each option to see more about fees, online access, and eligibility requirements. For any providers that looked interesting, I clicked through to their site to learn more and see if there might be any fine print. That was the most helpful site for finding an HSA provider for the $2,000 I wanted to keep safe because I could quickly look through the accounts paying the best interest rates and make a list of the ones I was eligible for. Another site that could be helpful, thought I didn’t end up using it much, is HSA Search. I didn’t find it to be as helpful as an initial search tool because you have to click through to each individual page to see details of each account, as opposed to HSA Rates where you can see it all right on the search page. But they do have a compare tool that could be an easy way to compare a few different providers side-by-side. I made my own spreadsheet for this purpose, but you might find the website easier to use. After a lot of research, including phone calls to several HSA providers to get details on fees and interest rates, I found found a few health savings accounts that stood out compared to the rest. Here are the accounts I chose and why I chose them. No fees at all for their basic HSA account. No monthly fees. No setup fee. No overdraft fees. No account closing fee. Nothing. Debit card to pay for medical expenses. Online enrollment and online banking that felt modern and easy to navigate. Here’s the page where you can check out their health savings account. Now, there are two downsides to Lively that gave me pause. The first is that it’s a pretty new start-up. While that seems to be a factor in the superior online experience compared to other providers, which is a definite plus, it also means I don’t know how this provider might change going forward. There are no fees now, but what if they’re not profitable? Will they raise fees in the future? It’s something I have to watch out for. One big thing that comforted me here is that their health savings account is FDIC insured, meaning that I don’t have to worry about losing my money if the company fails. Without that, I probably wouldn’t have been comfortable giving them a shot. The second downside is the interest rate. They have a tiered system that currently starts at 0.05% for balances under $2,500 and goes up to 0.55% for balances of $15,000 or more. There are a number of HSA providers offering better interest rates. One catch is that many of them are local credit unions that I wasn’t eligible to bank with. You might be able to though, depending on where you live, and again HSA Rates is the best site I know for finding one. Connexus Credit Union offered 1% interest with a $5 fee to gain eligibility, but it also came with a $2 monthly maintenance fee. First Technology Federal Credit Union offered 1% interest with an $8 fee to gain eligibility. I also really liked HSA Authority, which, like Lively, came with minimal fees. To be honest, I was planning on going with them until I found Lively. Assuming that I consistently keep my balance at around $2,000, the difference in fees and interest rates would only lose me about $19 per year. It’s not nothing, but it’s not life-changing either. More importantly, I don’t have to worry about ANY fees, even if I accidentally overdraft. With the other providers, even one accidental overdraft would have wiped out any potential benefit from the higher interest rate. I liked the smooth online interface. Some of the other providers were a lot clunkier and seemed like they might be difficult to use. As it turns out, Lively was also one of the most desirable investment options. By keeping all my HSA money with a single provider instead of using one for savings/spending and one for investing, I could make my life that much simpler. Yep! The exact same provider. Now, I’ll be honest, I could have gone in a few different directions here. And depending on what you want out of your HSA investments you might be better off using a different provider. The $2.50 monthly maintenance fee was lower than most and there are no other fees to worry about. I especially like that there’s no custodial fee, unlike some of the other options I’ll mention below, which means that my costs won’t rise as my account balance rises. Access to a strong list of commission-free ETFs through TD Ameritrade. I didn’t like that I couldn’t get free access to Vanguard funds, which is always my preferred route, but there are enough high-quality, low-cost funds in that list that I can put together a good investment portfolio. The option of investing 100% of my HSA. Other providers require you to keep some amount of money in a lower-yield savings account, and I like that I could choose to invest my entire HSA if my circumstances change down the line and I no longer need to keep some of my money available to spend. The ability to have the savings and investment components of my health savings account with the same company. Here’s the page that explains the investment aspects of their HSA. Here are some of the other good options I found, along with why I didn’t end up choosing them. HSA Authority – To be honest, I flipped back and forth a few times as to whether I liked Lively or HSA Authority better. The annual fee for HSA Authority is only $6 more and it offers Vanguard funds, which is a huge plus for me. In the end I went with Lively only because I liked the savings account a little better, I wanted to keep my money in one place, I could save a small amount in fees, and I wanted to give the startup a shot. Saturna Capital – This is another good option that could actually cost less if you used it right. They have no annual or monthly fee but they charge you $14.95 per trade in your investment account (plus a $10 surcharge for Vanguard and Fidelity funds), and another $4 per year to reinvest your dividends. So if you only make one contribution per year and put it all into a single fund, you could save money with Saturna. I preferred the simplified fee structures of the other providers, but you might see things differently. SelectAccount – There’s an $18 annual fee for the privilege of investing, along with a requirement to keep $1,000 in an HSA savings account that would earn between 0.10% and 0.20% interest and cost an additional $12 per year in monthly fees. The initial investment options include a pre-selected group of Vanguard funds, and once you have a $10,000 balance you can access Schwab’s brokerage platform, opening up a much wider range of investments. HSA Bank – There’s a $5.50 monthly fee unless you keep at least $5,000 in their low-interest savings account, in which case that fee would be waived. And they offer two different investment platforms. One is through TD Ameritrade, which is the same as Lively. The other is through Devenir and offers only a pre-selected set of high-cost mutual funds. All-in-all it’s a fine option as long as you invest with TD Ameritrade, but the other providers are, in my opinion, better. Health Equity – With a $36 annual fee and a 0.40% custodial fee, the costs were too high to seriously consider them. The custodial fee in particular is a deal breaker since it means that my costs would increase as my account balance increases. Health Savings Administrators – Like Health Equity, the costs were too high. There is a $45 annual fee and a 0.25% custodial fee. Optum Bank – I had to call for information on this option, since details are hard to find online. I was told that there is a $2.75 monthly fee unless you hold $3,000 in their savings account, which starts at 0.05% interest. And there is a 0.36% custodial fee but it’s capped at $10 per month, which makes it more attractive than the two previous providers. In the end though, the fees are still too high. Quick note: Do you want real answers to your personal money questions? Click here to learn how to get them. 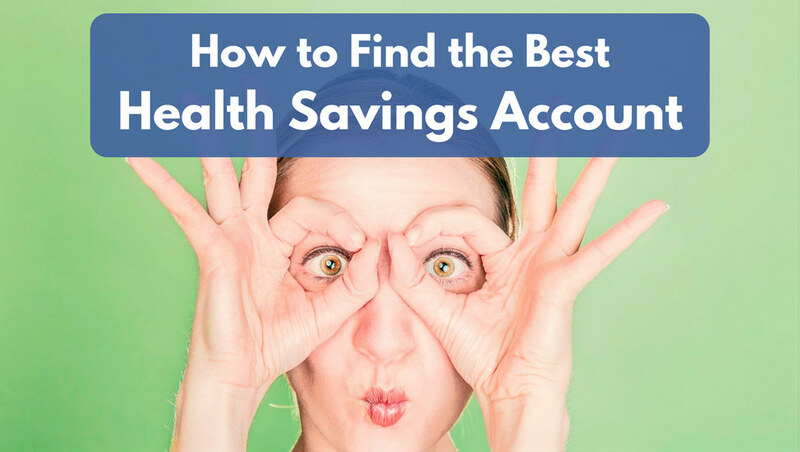 So that’s how I went about my personal search for a health savings account and how I found the best HSA providers for my personal needs. I honestly don’t for sure that they’re the absolute best options out there, but I know they’ll do a good job of meeting my needs. And no matter what I’m excited to finally have access to this awesome account! Have you ever done you own search for a health savings account? Which provider did you end up using and why? Matt great info on the different providers. As a whole the HSA is a great retirement planning vehicle especially in light of the estimated $200,000 or more that a couple is likely to spend on health insurance and other medical costs in a “typical” retirement. In fact an HSA may be the difference in retirement success and running out of money due to these high medical costs in some cases. In our case we are fortunate in that my wife’s employer contributes a certain percentage to her HSA as well as her contributions each pay period. Thanks for the insights Roger! Sounds like your wife’s employer has the right idea. It’s great to see people starting to embrace these accounts. I have yet to open an HSA, however I definitely plan to use an HSA as one of my investment vehicles. I’ll definitely be bookmarking this one to evaluate providers once I move forward. Great article! Thanks Dane! I’m glad you found it helpful. You should check out Elements Financial to compare to your group of choices. They have a $3/mo charge on a checking account under $2,500 but they pay 1% interest on that balance. They also give you access to TD Ameritrade which has a lot of commission free trade options like VTI (Vanguard Total Stock Market Index). I try to keep the $2,500 plus a cushion in the checking account and invest the rest in the brokerage account. The only bummer is that they recently started requiring a wire to send funds to your TD Ameritrade account instead of an ETF and they charge $24 per wire transfer. That essentially limits me to one transfer per year and I treat it like a $2 monthly account fee. Still more competitive than a lot of others, but I’m hoping for a work around soon. I did see them but I didn’t like that wire fee. I basically saw them as similar to Saturna Capital, but with a higher per trade fee AND a possible monthly charge. Maybe I’m missing something there though? Yes, with the changes I think they are quite similar to Saturna Capital, though I don’t know what the interest rate they offer on checking account funds. In both cases, limiting your trades is the only way to keep costs low. I went to them initially when there was no account minimum or wire transfer fee and they’ve since implemented those additional costs. The only problem is that it still makes them competitive to the alternatives like HSA Bank or HSA Administrators so I have no motivation to switch yet. I may have missed something so forgive me if this was already answered, but how do you use the money for retirement (non-medical related)? It is that time of year again and I can pick a high-deductible plan so I’m seriously considering this option with a HSA. Good question Marta! Once you reach 65 you are able with withdraw the money penalty-free, even for non-medical expenses. The money IS taxed, so in essence it ends up working just like a 401(k) or Traditional IRA. I’m currently comparing providers. How did Health Equity and Alliant Credit Union measure? Saturna is one I am also considering. I didn’t come across Health Equity in my search so I don’t know much about them. Alliant Credit Union definitely looked like a good provider though for the short-term savings portion. I’d love to hear what you end up choosing! Thanks Wendell! And good question. The honest answer is that I haven’t checked interest rates again since I wrote this. I’m guess that since it was relatively recently, not a whole lot has changed, but I don’t know that for sure. Also, I didn’t mean for this to be an outright endorsement of any particular bank. What I really intended was to show you how to do this same search for yourself so that you could find the right account for your own particular needs. Everyone’s situation is different, and my hope is that this article gives you the tools you need to find your own way. I have a quick question if you put in a lump sum the max amount for 2016 this is already taxed money. how does the tax advantage work? you will be refunded the money when you file your 2016 taxes then? Unfortunately, I live in NJ and HSA contributions are taxed in NJ…but at least the interest earnings aren’t taxed. does anyone have any additional information that could be helpful? Let me start by saying that I am not an accountant and I’m therefore not 100% familiar with the exact logistics, but I believe that it would simply be counted as a deduction when you fill out your tax return, which would serve to either reduce the taxes you owe or increase your refund. This is a great post, exactly what I was looking for! However, I was all set to sign up with Health Savings Administrators, but then I saw that they also charge a custodial fee: “The custodial fee is 6.25 basis points per quarter (i.e, $0.625 per $1,000 every three months) with no cap. Fee is deducted from the account balance each quarter.” This is a not insignificant amount, especially if you’re planning on using the account for investing. If you have $20,000 in the account, the charge would be $12.50 per quarter, or another $50.00 per year! That’s on top of the $45 fee you’re already paying! http://healthsavings.com/members/fees/ You may want to check the fine print on your account and make sure you’re not being charged this “custodial fee”. It made the difference between this HSA provider and another one for me. Oh wow, that must be new. Thanks for pointing it out Janice! I’ll update the post to make sure people know about that. Just confirmed Janice’s assertion about Health Savings Administrators. For my wife and I with two accounts and total balace of around $26K the annual fees would be a whopping $155.00!! Pretty steep! That’s too bad! I always hate to see companies adding fees. I am new to your site Matt. Enjoyed the read of HSA. My question is, what is the maximum amount you can annually fund in a HSA? Thanks Tom! For 2015 the max contribution is $3,350 if you have individual coverage and $6,650 if you have family coverage. For 2016 it’s $3,350 for individuals and $6,750 for families. You can read more about how HSAs work here: How to Find the Best Health Savings Account. Good call! You’re absolutely right. That’s a valuable extra contribution if you’re eligible. One thing I realized just now as I was comparing HSA fees is that I needed to take into account my “net fee” based on the interest the account pays. I noticed a lot of the HSA providers that have “high” monthly fees also have the highest interest rates. If I am starting out my HSA with a lump-sum, any fees I pay can be cancelled out by the interest I earn. For someone like me who needed to drop a few thousand dollars in an HSA to lower my AGI this year, I just view this initial contribution as my “new zero” in the account, and anything I contribute above this initial amount is “fee-free” as it grows in the future, at a higher interest rate than is offered elsewhere (even though other places might have slightly lower fees). So glad to hear it helped Justin! Nice work taking action. And you make a great point too. A higher fee absolutely might be justified if the interest you earn outweighs it. And that break-even point is going to depend on how much money is in the account. Thanks for bringing up such a great point! Any updates on ease of use for any on these sites? I used hsa bank a couple years ago and their interface and online banking was awful. It looks like they might have overhauled their site but wondering if anyone has any experience. My family will likely plow through the the account each year so I’m more interested in usability than investments. Also has anyone had experience with Alliant hsa? I don’t have any new updates for you John, but I will say that I have a few financial planner friends who have recommended Alliant to me at various points in time. I can’t speak specifically to usability, but that definitely seems to be a good option. Good luck! As an FYI, Lake Michigan Credit Union requires a minimum of $5 deposit into a ‘member’s saving account’ in addition to the $5 ALS donation for a total of $10 to open a HSA. You do get the $5 member savings account money back when/if you were to close the account. Just thought I would update this as I recently opened accounts for my wife and I. It’s not a tremendous fee, but a fee nonetheless. Shortly after stumbling upon your blog, I opened up an HSA at Lake Michigan Credit Union. I am completely satisfied with this financial institution. Without reservation I highly recommend them: their customer service is friendly, they rapidly respond to my calls(and emails), and the website is easy to navigate. Theyve also got a 6.25% interest rate on a VISA card — an excellent choice if you want to do a balance transfer. Thanks for the dumb luck! Great work! I’m glad it was helpful and I’m glad that it’s worked out for you so well. Thanks for the update! I hadn’t noticed that when I checked it out. Yeah, I would really consider that one just a savings account with a good interest rate. Ideal for money you may want to use in the near future but not for long-term investment purposes. LMCU dropped their interest rate early 2016 to 1% regardless of amount in the account. Previously 1.5% interest rate on balances under $5,000. 2% on balances over that amount. Bummer because I keep a high amount in the account. Thanks for the information – I have an HSA account that I am thinking of changing to another. Since I elected to opt out of my current employer’s medical coverage and switching to my wifes coverage, there is no High Deductible option. After reviewing IRS info, it appears you can rollover an HSA account to another HSA. Is this something you are aware of? Yes, you can absolutely rollover an HSA account. I would first decide where you want to open the new account and then ask them about their process for handling it. They will be able to help you. The one thing to watch out for is fees. The account you’re moving from may charge you to close the account or move the money, which may or may not be worth it. Hi Mike – you mentioned opening an HSA account through your business. Wondering if you found any small business HSA accounts that are worth looking at? Good question Abhi. So what I will actually do (still in progress) is open a personal HSA account and open an HRA account through my business. Here’s a good reference that explains how this works: http://www.watsoncpagroup.com/SubS-Chap7.pdf. I haven’t actually set this up yet, so unfortunately I don’t have any provider recommendations for the HRA. I do know another financial planner who has used Tasc online so they may be worth looking into. I THOUGHT THEY WERE PRETTY STEEP, ESPECIALLY THE WIRE TRANSFER FEES. BUT I LOVED ALL THE INFO YOU SHARED MATT, CHEERS! Thanks for the link Delaina. I don’t think that most people will run into most of those fees, but you’re definitely right that it’s something to look out for. I found LMCU a few years ago. They have a good high interest reward checking account too. Ive added to the HSA 3 years now so Im over $10k. Its not worth paying any fees to invest such small amounts. Not to mention the fact that I might lose money. No need to withdraw any monies so I don’t think I even activated the debit card. I presume if I ever incur big medical expenses, I can just move some to my checking. I’m glad it’s worked so well for you! I recently contacted them about opening an account and asked if I could move money into my checking rather than use checks or debit card, and the answer was yes but with a $35 transfer fee. This was incredibly helpful. You said you hadn’t opened on yet because you’d probably open it through your business. I’m self employed and interested in learning more about opening an account through my business as well. Have you done this research and have any tips to share on that side of things? Thanks again! Good question! Believe it or not, I STILL haven’t gotten around to it. I will definitely be writing a post about it when I do though, so stay tuned! looking forward your experience/steps to open your HSA via your own business. Good question Linda, and sorry for such a delayed response. No matter how the contribution is made it will be considered pre-tax for income tax purposes. That will be factored into his tax return at the end of the year. The advantage of having it deducted from your paycheck is that you can also avoid FICA taxes. He may be out of luck with that if his employer doesn’t offer that capability, but it might be worth asking again. Thanks Matt for all the info. HSA info is not easily accessible. My husband and I are both over 55. Do we open individual HSA accounts for 2015 the max contribution of $3,350 plus $1000 if you have individual coverage or $6,650 family? You’re welcome Randi! For 2015 the contribution limit for people over 55 is $4,350 if you have individual coverage and $7,650 if you have family coverage. It does not matter whether you split those contributions up over multiple health savings accounts or one. The limit is applied to the sum of all contributions. So, Can I open up one account for me for $4350 and another for my husband for $4350 or the total for both together cannot exceed $7650?? Randi, it appears that I was slightly mistaken in my original answer and I apologize for the confusion. After a little more research, it appears that BOTH spouses can make the $1,000 catch-up contribution on top of the normal limit, but that those catch-up contributions must be made in separate accounts. See here. So in summary, for you are allowed to contribute $6,650 TOTAL across all accounts, no matter who opens them. Then are you ALSO allowed to make an additional $1,000 contribution to your account AND an additional $1,000 to your husband’s account. I hope that clears things up and again I’m sorry for the confusion here. Matt, can you please clarify for the scenario I have in mind: in the case of a husband and wife both over 55, can individual HSA accounts be opened for each of them (thus benefitting from the $1,000 catch-up contribution on each account) even though there is only one (family coverage) health-insurance plan (where the primary insured is one of the spouses)? I.e., the second spouse doesn’t have their own HSA-qualified plan. Good question Patrick. This situation is a little confusing, as you can see by the fact that I gave an incorrect answer to someone asking the same question earlier! On a family plan, you are allowed to contribute $6,750 as your base contribution (for 2016). You can do this in one account or two, but no matter what the combined limit is $6,750. This assumes that you are BOTH covered by the HSA qualified plan, even though only one of you is the primary insured. If one of you is covered by a different, non-HSA qualified plan, then that person cannot make a catch-up contribution and the other person’s base contribution is only $3,350. Thanks for sharing your insights, great post. I opened an account with First American Bank online a year or two ago. They allow you to start transferring funds to invest once your balance hits $2,000, but if you do decide to invest I was surprised to find out that there is a $4.95/mo fee (there were no fees prior to investing). Overall I am happy with First American. The online bill pay works well. After the research I did today, I don’t think I’ll be moving my account. I’m not in love with the short list of investment options, but at least they do offer Vanguard mid- and small-cap equity ETFs and one good corporate bond fund, all three of which have very low fees. Most of the other options had higher fees. I haven’t seen any disclosure on any other “% of assets” or trading fees, and if the only fees are $4.95/mo and the low index fund fees, I will be very happy. Overall I have found it very hard to understand the fee disclosures in my research. I hope a more progressive company like Sofi gets into this space and offers a more transparent option with low fees. I max out the HSA contribution through my employer who matches $500. I pay for medical expenses out of pocket, but save my receipts. Can reimburse myself at anytime. Just earmark the receipt and keep with your tax return. Contribute through employer and save on payroll taxes. I would like to steer everyone away from Health Savings Administrators. Not only are their fees ridiculous but they make you fill out a from and mail it in to close your account. Talk about a bunch of scammers. DON’T USE HEALTH SAVINGS ADMINISTRATORS! Valuable ideas – I learned a lot from the facts – Does someone know if my company might obtain a fillable GA DOL-1a document to fill out ? I’ve had an HSA for awhile and had HSADMIN. Horrid! At over 65, I now have an HRA, but moved the funds in Jan. to LMCU based on reading your posts. Just checked online and they dropped the 2% yield to 1%. Bummer. I will only use $$$ for medical emerg, otherwise, I need to earn interest, & not pay annual fees. Online ssearch saw Connexus CU has a 2% HSA rate, but requires bill pay, and their reviews are pretty poor. Nothing listed for HSA reviews. If you know of viable options, please advise. Or do I need to stay where I am, be happy I have no fees to pay, and take the 1% APR. Thanks. It sounds like what you have now is pretty good, so I wouldn’t be in a huge rush to change it. But if you’d like to be able to invest at least some of the money, you could consider using HSA or Saturna Capital, both of which looked pretty good in the course of my research. I would also suggest clicking through to some of the resources I mention in the post so that you can search around yourself based on the specific criteria you’re looking for. Good luck! Lake MI Credit Union reduced from 2% to 1% in April 2016. I could be wrong but for Staturna Capital I believe that 14.95 fee applies to equity trades. You can still put money into their funds for free but they don’t seem to have any really low expense funds. You’re right that mutual funds are a mixed mag. There are some no transaction fee funds, but they come with minimum investment requirements and the list is fairly limited. Other mutual funds either have the same $14.95 trading fee or their own sales load. So for the most part it isn’t free, though if you like any of the no transaction fee funds it could be. Has anyone had experience with SelectAccount? Pricing seems reasonable if you have over 10k saved… Thoughts? Have any of you looked at Connexus on the HSA directory? It is a 1.5% APY and you can join by donating $5. I don’t see any other fees. Is there anything I am missing or should be aware of with joining them for my MSA? Thanks for all this fabulous advice. So appreciative. Good find Angela! Looking at their rate sheet, it looks like a tiered interest rate where you currently earn 0% on balances up to $99, 0.5% if your balance is between $100 and $499.99, 1% if your balance is between 500 and $4,999.99, 1.5% if your balance is between $5,000 and $14,999.99, and 2% if your balance is above that. So it’s a good option, but your balance would have to be fairly large to get to 1.5%. I just found Connexus on hsarates.com today and FINALLY applied for my first HSA. Thanks for ALL of the helpful info, Matt! And the helpful hyperlinks. Seems like your hard work and investigation has helped many of us. You’re welcome Callie! I’m really glad to hear that it’s been helpful. I was checking the same. 1000$ contribution, and I put in the state of New Jersey. It gave me a huge list of banks. I also found Connexus as an option, however, do I need to have access to the bank (branch/ATMs) or is that not a big deal. Appreciate your input. Good question Sridhar. It depends on how you plan to use the account, but as long as you have online access and a debit card, there likely won’t be much need for a local branch. At least that’s been my experience. This is an awesome article, I’m glad you reposted. I know the answer to this question but just thought I’d triple check…if my employer offers an FSA, then I’m no longer eligible for an HSA, correct? I’d love to not participate in the FSA and open my own HSA, but I did some research and don’t think it’s possible. Good question Britt. I believe, though I’m honestly not 100% sure, that you can still contribute to an HSA as long as you don’t also contribute to the FSA. In other words, I believe it’s the contributing that disqualifies you, not simply having it available. I would definitely consult with an accountant, or even call the IRS, before relying on that though. It also depends on the type of FSA that you have. In some cases you’re allowed to contribute to both. Here’s a good overview: HSA and FSA In The Same Year. 1. Monthly fees are low (ranging from $4/month to $0), depending on what level of interest you’d like. 2. You only need $1000 in the base account before you’re allowed to invest the remainder. This lower threshold means you have more of your money invested and “working for you” than sitting in an account earning negligible interest. Most of the HSA custodians I reviewed required $2000–2500 in the base account before being allowed to invest the remainder. 3. In addition to the regular monthly charges, the investment account is only an additional $18/year. While the selection of funds (https://www.selectaccount.com/wp-content/uploads/SelectAccount-HSA-Mutual-Funds-03.31.15.pdf) isn’t amazing, there are a few Vanguard index funds that cover large-to-small cap and one high-yield bond to choose from. Given that, for most people, this wouldn’t be their main investment account, I felt the options here sufficed. Furthermore, if you have a balance of over $10K in your account, you have access to a self-directed HSA brokerage investment account with Charles Schwab which gives you access to more than 2,500 mutual funds, and any other stocks/bonds/investments of your choice. 4. SelectAccount’s website interface is user-friendly. For example, if you use the ThriftSaver option ($1/month) and max out the HSA limit for the 2017 year ($3400), SelectAccount would allow $2400 of that to be invested. Lastly, if your overall account balance is more than $2500, the monthly fee is waived altogether (for the ThriftSaver option only). So, in this example, you’d only be paying $18 for the ENTIRE YEAR of maintaining both the HSA and investment accounts through SelectAccount, easily recouped via the investments. No other fees for setup, closing, or transferring of funds. It seems HSA options are wide-ranging, hope this helps someone. Thanks for the input Vin! I hadn’t heard of them but just checked them out and they do look like a good option. Like you, I’m not thrilled by the initial investment options but it seems like that would largely be a non-issue once your balance exceeds $10,000 and you have access to Schwab’s trading platform. I don’t know exactly which funds would be available at that point, but I’m guessing you would be able to find a few good ones. I’m also not thrilled about having to keep $1,000 in a low-interest savings account, but the truth is that the annual difference between this and Alliant would be pretty small and you could actually save money on the investment side of things. So that’s not really an issue either. All in all, it looks like a great provider and I really appreciate you pointing it out! Very helpful information. Do you have a high deductible individual health insurance plan? The HSA’s that I found required that (i.e Bank of America). Any opinions on that one? Thanks. Yes, you definitely have to have a qualifying high deductible health insurance plan. Otherwise you aren’t eligible to make contributions. Here’s more on what that means: https://www.zanebenefits.com/blog/bid/266885/faq-what-is-an-hsa-high-deductible-health-plan-hdhp. I currently have an HSA account with Health Savings Administrators. I have about $23,000 in four different Vanguard accounts. I basically have all my funds invested in the Vanguard accounts. Is there another HSA provider that has lower fees? I just discovered your website and blog. I truly enjoy reading your posts. Hey Al. I would look at some of the other HSA providers mentioned in this article. Health Savings Administrators is certainly good, but that ongoing 0.25% fee will definitely cost you assuming that you maintain a reasonably sized account balance. Some of the other providers have flatter fees that won’t grow with your account balance. Just wanted to thank you for this thorough article and the follow-ups. I’m finally opening an HSA so I can lower my income tax. I’m debating between Alliant, Connexus, and Select. I can put a decent amount in (over $3K) to start and hate paying fees! Any new thoughts? Thanks! You’re welcome Lisa! I haven’t looked into this again since I updated this post in January, so what you see here is the best I’ve got. Good luck! Adding more detail to this statement “In all honesty, going with HSA Bank would have saved me a small amount of money.” actually you won’t sicne HSA bank has 2 investment options onr has no annual fee but charges $6.95 per trade on TD Ameritrade and the other one has no trading fees but charges another $24 annual fee which will be on top $5.5 per month makes it to at-least $90 annually which is higher than Alliant charging $71.4 per year. I am going with Alliant thank you for the post! You’re welcome Angy! I would personally choose from their list of commission-free ETFs, so that wouldn’t be an issue for me. But if you wanted to choose different investments, you’re absolutely right that that would add to the cost. Another detail with SelectAccount is once you able to open a schwab brokerage account there will be trading fees 4.95 per trade. So if someone contribute to the account monthly like me it’ll be another 4.95 per month. Similar to HSA Bank, Schwab offers a number of commission-free ETFs that I would be comfortable using, so most people should be able to work around this cost. But it’s definitely something to look out for and I appreciate you pointing it out! Thanks for the information Matt. I just opened an account with Alliant based on researching the available choices and the information you provided validated the same and it worked great. Just to update Alliant has a 0.65% savings for HSA but only a $100 min. So I should be able to put the rest into index funds with the $5.95/month fee. Even though the fee is not desirable, seems like the best choice. Basically I equated the fee to wipe out 1% of any returns from $6750 contribution for HSA to put it in that perspective. If one makes two year contributions the fee will be 0.5%. Also I had to speak to their customer support due to website error but their support team was first class which is another positive. ON another note found out their regular savings account gives 1.05% APR return and I opened one as well and will plan to park some cash there. Thanks for all the info Mathew! Very helpful. Can you tell me if it possible to roll-over retirement money in a 401k/403b to an HSA? Good question Tina, and one that I honestly didn’t know the answer to until you asked. I did a little research and it looks like you aren’t able to rollover directly to and HSA from a 401(k), but that you can potentially do it in two steps by rolling it to an IRA first and then rolling it from your IRA to your HSA. You can find a high level overview on this here. I’ve never done this before so I don’t know what the potential hang-ups are to this process. I would suggest talking to a CPA or other tax expert who’s familiar with this process before making any moves. Wow. Thanks for breaking it down so nicely. I have a question. My husband and I are covered under a single insurance policy, we are both over 55 and self employed. Are we allowed to have separate HSAs in order to take advantage of the catch up amount for both of us (i.e. $1,000 each?) Sorry complicated question. I hope I asked it correctly. Thanks again. You’re welcome Brenda! My understanding is that the normal family contribution amount can all be made to a single account, but the catch-up contributions must be made to different accounts. See here. So yes, you are allowed to have separate accounts. Your article was very helpful. I was debating between Select Account and Alliant, and with your article I settled on Alliant. I ended up calling their customer service number because i wasn’t sure if I had to open either a checking or savings in addition to the HSA account for any amount above $1k for investment. it’s a Sunday and even through the lady on the phone was very friendly, she wasn’t able to give me an answer. In order to be able to invest (any amount above $1k), did you have to open any other accounts or could straight invest from your HSA account? I’m sorry the process was confusing Penney. I definitely wish that some of these companies had better user interfaces. So yes, they do require you to keep $1,000 in their basic HSA savings account. That works for me since I want to keep some money available for regular medical expenses, but I realize that it may not be ideal for everyone. If that doesn’t work for you, you might want to consider some of the other companies mentioned in the post. Thank you for such a detailed information on HSA, I just resigned and would like to transfer from my current HSA custodian to Alliant. Then I went to Alliant Credit Union website only to find that they will resign from HSA custodian business. Do you have any insight on HealthEquity? That’s too bad Jenny. Thanks for bringing this to my attention though. I’ll need to go back through all these options again, but when I ran the numbers back in January Health Equity actually came out as one of the more expensive options for investment purposes because of their 0.25% custodial fee. I would look at some of the other providers mentioned here to see if you can save yourself some money. I just got Alliant’s letter of resignation today and started researching my options. But now I’m going to try Connexus (1.5% for $6K). Thank you so much for this review; it is single-handedly making me a lot happier about the transition. Meanwhile I’m staying with Alliant for their regular savings account (just over 1% interest, and rising) and their rewards credit card (2% cash back). Oops, just realized Connexus has a $2 monthly fee. I can’t qualify for First Tech. I will look into Coastal. Thanks for sharing your thought process here Debbie. It’s frustrating when these companies change around their product offerings, but I hope you’ve been able to find something that works. Thanks for your informative posts. Have you decided where you will be moving your Alliant HSA? You’re welcome Gaylia. I haven’t had the opportunity to research new options yet, but I will be updating this post as soon as I do. Hi Matt, Would love to hear the results from your research. I am looking for HSA options right now and stumbled across your article. So far, I like the Connexus Credit Union but I still haven’t researched all the options. I found this article to be very helpful. This summer, I chose Alliant as my HSA as a result (having also looked at several other companies). To open the account I had to make a donation ($25) to their charity (helping foster children), which was fine with me. I was very happy with the 0.65% interest rate and no monthly fees. Then 3 months later, they sold/transferred their HSA accounts to Health Equity!So disappointing!! Health Equity has a 0.1% interest rate and normally charges $3.95 a month for balances under $2000. Alliant managed to negotiate the no monthly fee aspect of the account at least, but I’m not thrilled with Health Equity. We’ll see how it goes. Thank you for the information you gathered. As I said, it was very helpful for me. I need to open an HSA account mainly for medical for my special needs son, is there one you would recommend? We will be using it to pay his total individual and out of pocket deductible which will amount to $6,000.00. Hey Tania. I chose to go with Lively for essentially that exact purpose, using it to pay our current medical bills. I don’t have much to report on it yet since the year just started, but I can tell you that opening and funding the account and receiving the debit card have all been easy, and it hasn’t cost me a thing. Lake Michigan Credit Union now offers 20 mutual funds to invest in, including some Vanguard index and active funds. The annual fee is $30. I don’t see any other extra investment fees as of yet. Looks like you have to set aside $1000 in a savings account before being able to invest. I currently have my HSA account at LMCU and was getting ready to transfer it elsewhere for better investment options. I may end up staying with them after all once I thoroughly vet the various mutual funds. Thanks for the input Beth! Good to know that more HSA providers are starting to offer a wider range of services. And I can report that I just went with Lively this morning. I had several questions for support and they were exceedingly quick and thorough getting back to me. Thumbs up on excellent customer service! I currently have Health Equity, which you put on your “researched but didn’t like” list. I would add another reason for not liking them – they have the worst web site of any banking institution I’ve ever used. Unnavigable and unclear. I found your site while looking for somewhere to move to, and I appreciate the research you’ve done. Thanks for the input! I hope you’re able to find something that works for you moving forward. Great post. I was looking for some information on Bend’s HSA. http://www.bendhsa.com, any experience with them? Looks like a nice HSA, they say they use artificial intelligence to make it easy to maximize the HSA. Also have no monthly fees for individuals. Would love some insight. Thank you. I hadn’t heard of them Bob, but a quick look at website certainly makes it look like a viable option. Thanks for bringing it to my attention.